This entire arc has really put Aquaman through the wringer. His entire existence, the foundations of his core, have been shaken up pretty thoroughly, and he has really evolved into a King who deserves to be on the throne of Atlantis. He has suffered treachery and betrayal aplenty from all quarters. The way that Geoff teased out the entire tale was really magnificent. This issue, which had some truly big expectations to live up to, fulfilled all of them. This is the ultimate issue of the arc and thus there is lots of great action and lots of great character drama befitting such an issue. The best thing in the issue was Nereus, The King of the Atlantean realm of Xebel, the Second Sea. We don’t see much of him in this issue, which I was slightly sad about, but his still rocks throughout. I didn’t expect the character to be so endearing, in his own badass way, and that has truly been the surprise of this entire arc. Most of all, he stars prominently in the issue’s epilogue, which is what sets up Rise of the Seven Seas well and truly. It also connects back to Aquaman #23.2 from September, which was a one-shot starring Orm/Ocean Master. The way that Tony Bedard ended that issue finally makes sense, given this epilogue, and now I’m really excited about Orm’s return to the big leagues. Of couse, there is a lot more than that going on here. Such as the fact that Aquaman has to lead a counter-attack on Atlantis to face the First King of Atlantis, Atlan himself. The First King, returned from centuries of icy slumber, wants to establish his rule over all the Seven Seas and he is a cantankerous old man who is lost in his visions of lost grandeur. Geoff writes a really epic fight between him and Aquaman, which had me on the edge of my seat all the way. Truly great work throughout. Characters who were conspicuously missing from previous issues, such as Tula, Murk and Swatt also make their cameos here finally and its great to have them back. With the art, penciller Paul Pelletier, inker Sean Parsons, colourist Rod Reis and letterer Dezi Sienty all outdid themselves. They made this entire arc into a fantastically beautiful tale and this issue is their crowning glory, or so I’d like to think. The mood that the art creates is one of intense, heart-pumping action mixed in with lots of emotionally heroic moments where Aquaman proves that he is as badass a character as any other in the Justice League. He is a real character with real strengths and the art reinforces that all through. Of course, Aquaman also looks damn cool with that beard of his, which he grew at the end of #23 in August. It lends him a certain gravitas and even marks his heroism since he is no longer the young king trying to find his place in Atlantis. He has experienced a lot and he brings all that experience with him for this final battle. So thematically, that beard makes a lot of sense! I couldn’t have asked for a better issue. The fight between Aquaman and Atlan is over a little too quickly, and we don’t see much of either Mera or Nereus, but this was still a damn fine issue. I will definitely miss Geoff Johns on this title. He did much to make me care for the characters, to really get invested in him, and its been a great fourteen months with him (I didn’t start reading Aquaman until September last year). Now all my hopes are on incoming writer Jeff Parker, and I hope that he brings the same daring style to the book that Geoff did. That’s all I ask. More Aquaman: #0-12, #13-15, #16-21, #22-23, #23.1, #23.2, Annual #1. 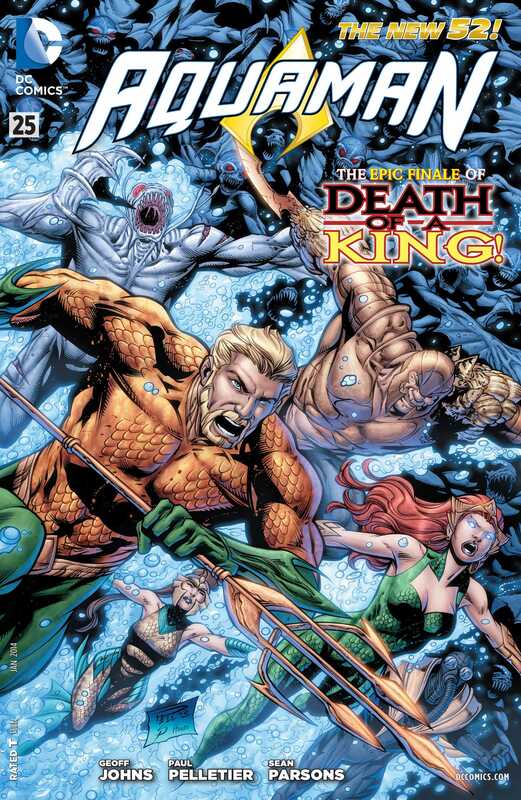 Posted on November 28, 2013, in Comics Reviews, Review Central and tagged Aquaman, Atlan, Atlantis, Comics, Comics Review, DC Comics, Death of a King, Dezi Sienty, First King, Geoff Johns, Mera, Nereus, New 52, Paul Pelletier, Review, Review Central, Rod Reis, Sean Parsons, Superheroes, Tula. Bookmark the permalink. 13 Comments.